This drive packs as many curves into as few miles as possible! We'll leave the Lodge and head straight for GA 348, and as soon as the curves stop, we'll turn around and drive it the other way. That's right, a double dose of GA 348! Then, we'll head northwest to Suches, taking GA 60, and head east on Wolf Pen Gap Road, which will put us at the top of the curves on US 129. We'll head south, completing a loop (with some overlap on US 19), and take a short detour to Dahlonega for lunch. 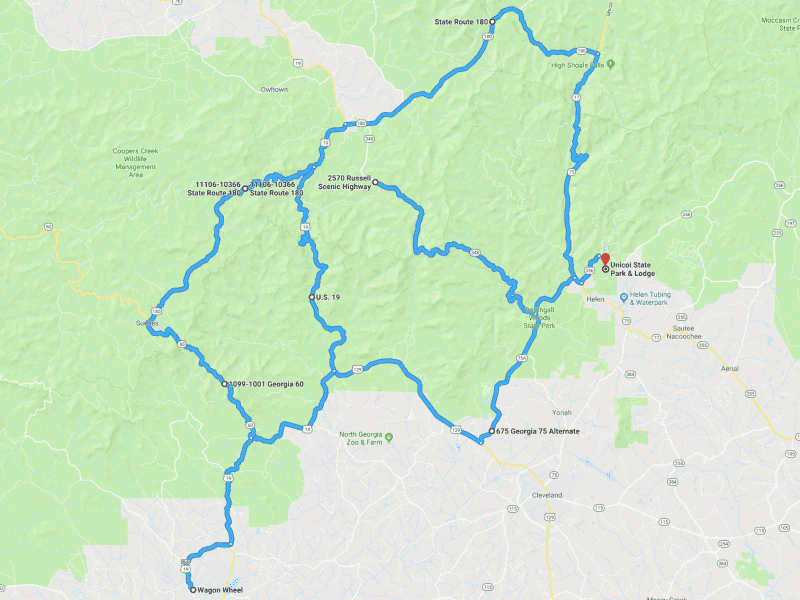 After lunch, we'll head back up GA 60 and over Wolf Pen Gap road again, then take a breather on GA 180 before heading south on GA 75 for our final stretch of curvy roads leading us to Unicoi Lodge. The map below doesn't fully convey the insanity that is this drive - drivers and passengers alike better be ready to hold on to their RS! This drive is recommended only for those with past QDM or HelenBack spirited driving experience. To recap: GA 348. Twice. GA 60 and Wolf Pen Gap Road. Twice. US 129 and GA 75, chock full of gravity cavaties and sweepers.